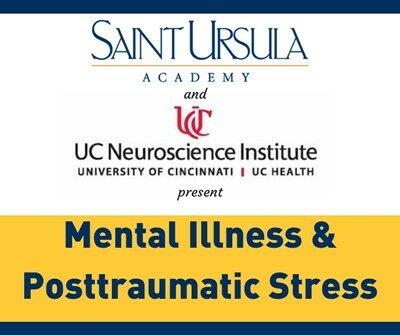 Cincinnati, Ohio, September 10, 2018 – Later this month, parents of Saint Ursula Academy students will have the opportunity to learn about mental health from the experts at University of Cincinnati’s Gardner Neuroscience Institute in the first installment of the SUA Counseling Department’s Parent Speaker Series. Part of Saint Ursula Academy’s mission is to provide caring support for each student's academic, emotional, social, psychological, and physical needs. One of the ways we focus on their emotional and psychological needs is our Parent Speaker Series, facilitated by our Counseling Department. On Thursday, September 27, Saint Ursula will welcome experts Joseph P. Broderick, MD; Kathleen M. Chard, PhD; and Caleb (Cal) Adler, MD, all from the UC Gardner Neuroscience Institute, into the Academy to discuss ways we can help our students deal with stressful situations. Especially in light of recent traumatic events, Saint Ursula realizes that young women may struggle with processing some of the anger and violence we hear about in the news. This special event, with a focus on Posttraumatic Stress, will give parents advice and information about how to help their daughters process stressful events in their lives. This event is open to all parents and friends of Saint Ursula Academy. For more information, or to register to attend, please visit www.saintursulaevents.com/parent-speaker-series/. Saint Ursula Academy is a Catholic, college-preparatory, secondary school for young women known for academic excellence and rich tradition. Saint Ursula welcomes students from more than 90 grade schools in the Greater Cincinnati area. The Academy is recognized by the U.S. Department of Education as a Blue Ribbon School. The campus, located at 1339 E. McMillan Street in East Walnut Hills has been the home of Saint Ursula Academy and Convent since 1910. The Class of 2018 earned college scholarships totaling more than $21-million.